At the top of the Font drop-down list on the Home tab in Word 2013 are two entries: one designated for headings and one for body text. If you use these settings rather than specifying individual fonts, you can reformat the document by choosing a different style set. A style set is a preset combination of fonts, paragraph line spacing, character spacing, and indentation. 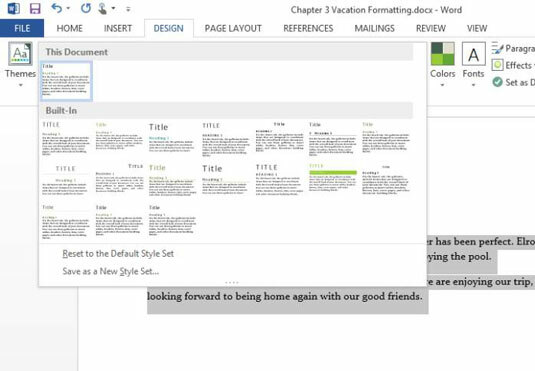 Style sets enable you to quickly change the look of the document without manually reformatting each paragraph. If you’ve manually applied specific fonts, you won’t see a change when you apply a different style set. If you don’t get the results you expect with a style set, select the entire document (press Ctrl+A), and then clear the formatting by clicking the Clear Formatting button on the Home tab or by pressing Ctrl+space bar. In your Word 2013 file, triple-click the title of your document. Choose Home→Clear All Formatting to remove all the formatting you’ve applied to the selected text. Notice that the manual formatting is cleared, but the font choice from the theme applied in the preceding exercise remains. From the Font drop-down list, click Calibri Light (Headings), or any other style you like, at the top of the list. The title text changes to the Calibri Light font. Select the rest of the document (everything except the title paragraph). Then open the Font drop-down list and select Constantia (Body), or any other style, at the top of the list. A list of available style sets appears. Pointing to an item allows you to preview it. Point to each of the style sets on the Style Set menu, one by one, and watch the document’s formatting change. Choose Lines (Distinctive), or any other style. The style set you picked is applied. Triple-click your heading and change the font size. Then click away from the text to deselect it. The document with changes looks is shown below. 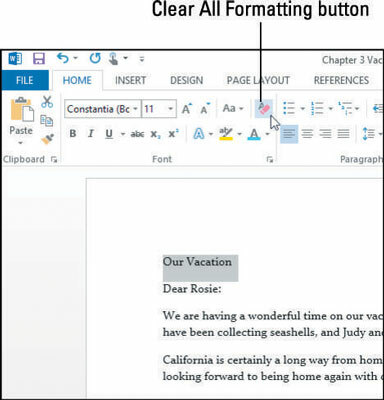 Save your work and close the document.